Recap: Porter’s defeats Founders League opponent, Kingswood- Oxford, 58-26. The team played great team basketball pulling down 47 rebounds, forcing 20 turnovers and grabbing 15 steals. They shot 41% from the field. Leading the team was Delaney Nwachukwu ’20 with 21 points, 9 rebounds, 3 assist, and 2 blocks. Also contributing was Callie Godfrey (12 points, 5 rebounds, 6 steals), Ana Bartkiewicz ’20 (12 points, 4 rebounds, 1 assist, 3 steals), Lila Conners ’20 (4 points, 9 rebounds, 3 assist, 3 steals), McKenzie Roller ’20 (3 points, 3 rebounds, 1 assist, 1 block), Sarah Zukowski ’19 (2 points, 8 rebounds, 3 assist, 1 steal), D’vine Straughter ’21 (2 points, 1 rebound, 1 assist), Maggie Coyne ’22 (2 points, 1 assist). Frankie LaBow ’22 (2 rebounds) and Laura Gouvin ’20 (2 assist). Recap: Porter's beat Westminster for the second time this season 50-21. Porter's saw great minutes from all 11 players and shot the ball well, shooting 50% from the field. Leading the team with 12 points each were juniors Callie Godfrey (2 rebounds, 1 assist, 2 steals, 1 block) and Delaney Nwachukwu (5 rebounds, 1 steal). 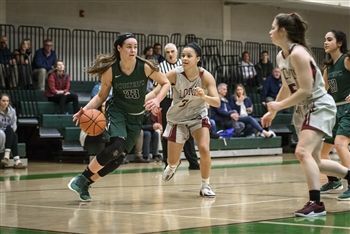 Also contributing were Ana Bartkiewicz '20 (11 points, 6 rebounds, 4 assist, 2 steals, 1 block), Lila Conners '20 (10 points, 6 rebounds, 3 assist, 1 steal, 1 block), Sarah Zukowski (2 points, 4 rebounds, 4 assist, 3 steals, 1 block), Frankie LaBow '22 (2 points, 1 rebound), Maggie Coyne '22 (1 point, 3 rebounds), Kyla Gallagher '20 (2 rebounds), D'vine Straughter '21 (2 rebounds, 2 assist, 3 steals), McKenzie Roller '20 (3 rebounds, 2 assist, 1 block), and Laura Gouvin '20 (1 rebound).